A few years back I had someone ask me to share a “Plan With Me Video”. These videos show someone happily writing their tasks, events and appointments in whichever planner or notebook they are using at the moment. The thought horrified me, as I tend to be easily sidetracked and figured this video might end up being three hours long with 15 minutes of useful material. However, it challenged me to consider how I actually plan and more importantly, how I approach or think about my own planning process. I want to encourage you to observe your own thinking/planning process if you haven’t already, ideally without association to a particular planner or planning system, if possible. I lead a boot camp aimed at this once a year called Planner Boot Camp, and it’s based on the same premise. As a former coach and one who has been privy to listening to the obstacles of many as they approach new ways of thinking and behaviors required for lifestyle change, I decided to listen and observe my own thinking and behaviors regarding my planning tendencies to learn what was useful and discover what was not. I recognized quickly that we carry our perceptions into the various realms of our lives. Often the same exact struggles surface in our approaches in the gym, relationships, nutritional choices, spiritual challenges and even career aspirations. As I set off to capture my thinking process in a shareable way, I realized I was doing the same things my clients would do when asked to share details of their lives. When we talk or think about our choices and behaviors in time, we tend to idealize as we present the information. This is good to do when projecting into the future, and setting goals, but it is not the best starting place for success in the long run. The best foundation must be based on reality for better or worse. We need objectivity, the ability to see with clarity in time. This is when short term tracking can be helpful. Not tracking for tracking’s sake, but specifically to assess reality. One doesn’t need to track a behavior for 6 months to see reality. It’s usually right within the 4-7 day window, which is why most dieticians recommend recording nutritional intake over the course of a week. Tracking our tendencies on paper allows for revelations and realistic goal setting leading to attainable goals. Isn’t that what we want? But life isn’t just about the attaining of goals. It’s about the slow parade of moments. If all we think and talk about are goals, goal setting and the heights of success, we neglect the fact that most of our lives are lived in the cascading flow of ordinary time. I knew and know for me, I want the moments in time, as much as I want the ring of accomplishment. Maybe more so, since that will make up the fabric of our lives. So taking all of this into consideration, I set forth to present an outline of how I approach each day. I attempted to condense my thought process in an ideal way while recognizing the constructs and limitations of time, energy, and the unique, mysterious fleetingness of ordinary days. To be intentional in my approach meant flip flopping who I wanted to be over what I wanted to do. 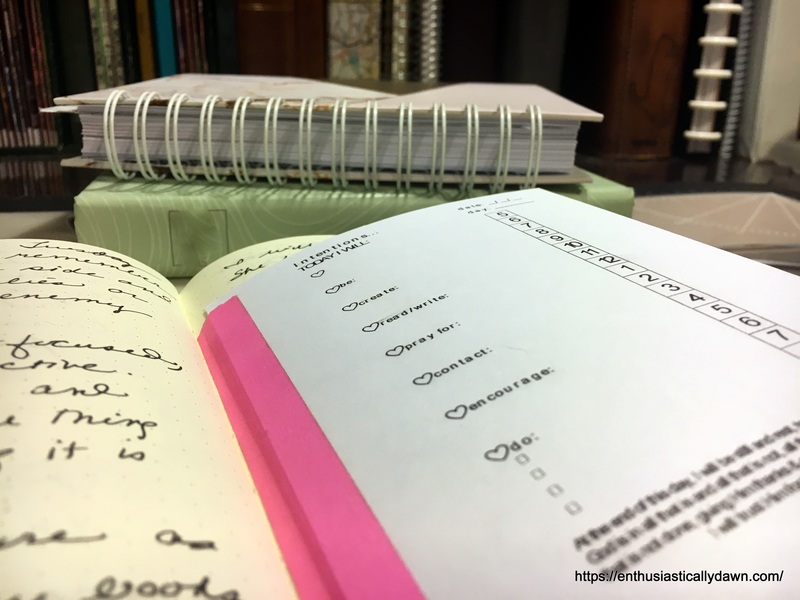 As I approach my planning in any planner I have already hashed out my heart’s desire through journaling daily intentions, ideas, thoughts, prayers and dreams. Being clear about who I am through my daily journaling practice frees me to say yes and/or no more easily in day-to-day interactions. Remember, I am speaking ideally at the moment. I definitely mess up and miss the mark… but there is grace for that, and I make room for it in my thinking. giving Him thanks and praise, I will trust Him for tomorrow. I encourage you to take the time to think through your approach to planning. Journal about it. Write the details, scribble out what you think you need from your planner that you are not getting. Let it look back at you from the paper and help you see clearly what is key to your planning lifestyle and what might be incidental, or not needful at all. I occasionally write through this list, and I have given it out as a printable thanks to a couple of more-talented-than-I friends who helps with Planner Boot Camp. But the point I want to make is, if you take the time and observe your own process with planning, tuning in to your rhythm- apart from any printable or particular planner-you will find how your planning process can be more purposeful for your specific needs and desires. You might even make peace with your planner (lifestyle), once and for all. Try it out: Assess your own planning habits. Become your own coach and observe objectively by recording what you do with regard to planning. If you are spending more time printing printables and/or shopping for the ultimate planner or planning system, discipline yourself to pare down to what you actually use and what is extraneous or distracting to your living the life you imagine or desire. Ask yourself what I call the “Thoreau” questions in your journal: Am I going confidently in the direction of my dreams at this time in my life? Am I living the life I’ve imagined? If not, what is one choice I can make today to simplify or move in that direction? Dawn Paoletta is the author of Journaling for Discovery and Delight – Creative Prompts for Your Journey and a self-proclaimed Planner Tramp. She loves to juggle words, chug coffee, journal excessively and abuse hashtags. She believes caffeine enhances her personality and sporadically serves up spontaneous journaling prompts on Instagram. She continues to blog, sharing her passion, poetry and prose at Enthusiastically, Dawn. That was informative, thanks Dawn!